The Arizona Coyotes will have newly acquired defenseman Niklas Hjalmarsson wear one of three ’A’s this season, reports AZCentral’s Sarah McLellan. Defenseman Oliver Ekman-Larsson will wear one of the others, but the final alternate captain has not yet been named. Head coach Rick Tocchet said that the team may name a captain, but not until some of the season plays out. Whoever the captain may be, he has big skates to fill. The team’s previous captain—longtime veteran Shane Doan—played his entire 21 year career with the team, including when the team was still in Winnipeg, MB. The Montreal Canadiens saved an opening day roster spot for 19 year-old defenseman Victor Mete. The rookie defenseman—drafted 100th overall in the 2016 NHL Entry Draft—impressed the organization that is in dire need of defensemen. The Canadiens lost Andrei Markov, Nathan Beaulieu, Alexei Emelin, and Mikhail Sergachev in the past year, and did little to replace them. The NHL and the Vegas Golden Knights have jointly donated $300K to victim relief from Sunday night’s shooting in Las Vegas. According to a team press release, the team will honor victims at season-opening games and provide additional assistance through pledge drives and other ventures. Selected second overall in the 2015 draft, Eichel immediately left Boston University for the professional ranks and make an impact as a rookie. He finished with 24 goals and 56 points in the 2015-16 season, but still finished just fourth in Calder Trophy voting as the league’s top rookie. Artemi Panarin, Shayne Gostisbehere and McDavid all finished above him despite Eichel coming second in rookie scoring and showing he could survive as a top-line center in the NHL. Last year, he suffered a high ankle sprain early in the season and was limited to just 61 games but once again proved his elite talent by scoring 57 points down the stretch. That total put Eichel 11th among forwards in points-per-game, ahead of players like Panarin, Vladimir Tarasenko and Jamie Benn. Eichel’s deal—like his career—will certainly be compared to draftmate McDavid’s eight-year, $100MM contract. While McDavid dealt with his own injury problems as a rookie, he bounced back this season to capture nearly every individual trophy available. Though Eichel isn’t quite at that level, the Sabres wanted to spend no time waiting around before locking him in long-term. As the new face of the franchise, he’ll be leaned on as the go-to offensive weapon and first-line center for some time. Ryan O’Reilly will offer a strong partner for him on the second line, but the Sabres future will hinge on Eichel’s improvement. 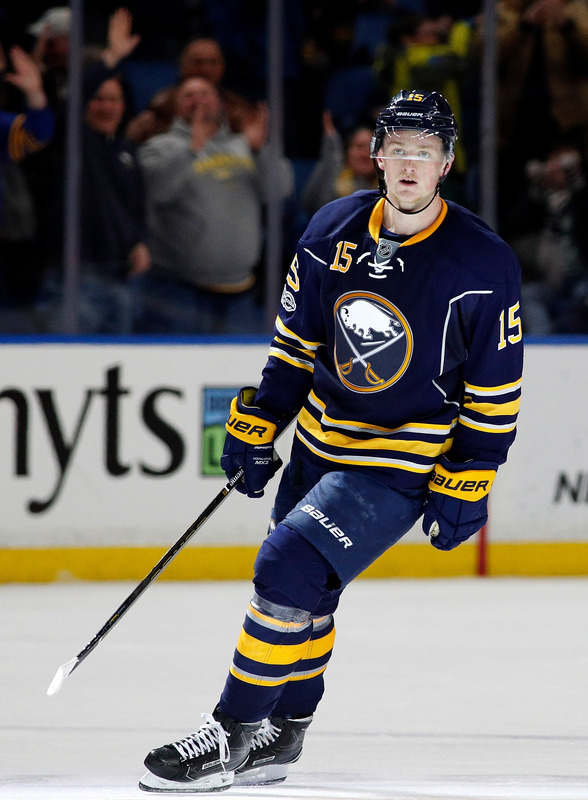 The deal has sent shockwaves throughout the league, as though Eichel was always expected to get a large contract extension many didn’t believe he would crack the $10MM mark. While he’s certainly talented enough, he still hasn’t won any individual awards or taken his team to the playoffs. As other teams look to extend their young stars—Toronto and Auston Matthews in particular—Eichel’s deal now represents a second data point behind McDavid to compare to. Matthews, whose 40 goals and 69 points easily eclipsed Eichel’s rookie season, will now have two comparable extensions to bring up in negotiations next summer. Should he lead the Maple Leafs to the playoffs once again, and even surpass his own rookie totals, something pushing close to McDavid’s $12.5MM per season is not out of the question. Still, some of Buffalo’s need to extend Eichel comes directly from that lack of playoff success. With the team struggling to put a playoff contender on the ice, letting Eichel get anywhere close to free agency (even restricted as it would have been) would have put a sour taste in the mouths of many fans. The 20-year old wasn’t going to give up money on a long-term deal before he’d really proven what he can do over a full season, so the team had to come in with an offer that would be in line with the other top players in the league. It doesn’t come without risk, as Eichel could regress or have more injury problems, but they’re willing to hitch their wagon to him right away. NBC Sports’ Kathryn Tappen was first to announce that a deal had been reached, while TSN’s Darren Dreger gave us the financial details. Anderson and the Blue Jackets were locked in contract negotiations all summer. Things rose to a head in September when Anderson reportedly asked for a trade. The final terms are lower than what two other prominent RFAs received. Calgary Flames’ Sam Bennett signed for $1.95MM a year, and Toronto Maple Leafs’ Connor Brown signed for $2.1MM a year. In his first full season with the Blue Jackets, Anderson scored 17G and 12A in 78 games and an additional 1G and 1A in 5 playoff games. Columbus valued him enough to make moves prior to the expansion draft to protect him and other prospects, but apparently did not budge from its contract valuation. Head coach John Tortorella stated earlier this offseason that Anderson will have to earn his spot on the team. Sportnet’s Elliotte Friedman was first to confirm that the deal was done. Veteran forward—and fan-favorite—Jaromir Jagr is reportedly signing with the Calgary Flames, but the Athletic’s Pierre LeBrun reports that the signing will not be official until the organization handles Jagr’s immigration to Canada. The team does not expect Jagr to report to Calgary until Wednesday. The delay benefits the Flames because now they will have more room to make roster moves before locking up Jagr’s roster spot. The Flames have a few million in cap space to work with, but their decisions are more about which prospects stay with the club. Immigration issues do not necessarily imply a problem. Rather, they routinely crop up when a player moves from one country to another. Last season the Vancouver Canucks traded Jannik Hansen to the San Jose Sharks, but Jansen required a U.S. work visa before being able to report to the Sharks. Even though hockey players have agents and lawyers, they still have to navigate the immigration system like regular citizens to legally work in Canada or the United States. TSN’s Bob McKenzie tweeted this evening that Cody Franson and Alex Chiasson are “more likely than not” to sign NHL deals this week. Both were unrestricted free agents who were unable to secure contracts this offseason. Defenseman Cody Franson signed a professional tryout agreement (PTO) with the Chicago Blackhawks after failing to land a deal with another NHL team this summer. Franson last played for the Buffalo Sabres, scoring 3G and 16A in 68 games. His last contract with the Sabres was a two year deal worth $3.325MM a year. Part of the delay may be that the Blackhawks are waiting for the NHL to approve Marian Hossa’s IR status. Forward Alex Chiasson signed a professional tryout agreement with the Washington Capitals this summer—a team effort to boost forward depth. Chiasson scored 12G and 12A in 81 games for the Calgary Flames. If Chiasson stayed with the Capitals, it would be his fourth team in five full NHL seasons (not including his 7 game rookie season). The Capitals will also have to engage in some creative cap maneuvering because they are currently $39K above the cap. McKenzie did not specify which teams would sign the above players, but usually players sign with the teams who offered the PTO. Nevertheless—like Kris Versteeg last season—a player could use the PTO opportunity to garner offers from the rest of the league. The Devils open up the season at home against the Colorado Avalanche on Saturday October 7th. Boyle has not joined practices yet, but coach John Hynes says that Boyle should be ready to go if he can get a full week of intense practices before the 7th. Hynes is confident that Boyle will return in time for opening puck drop. The Devils signed Boyle to a two-year, $2.75MM a year deal in the offseason. Last season Boyle played with the Tampa Bay Lightning before being traded to the Toronto Maple Leafs for an abbreviated playoff drive. In 75 games Boyle scored 13G and 12A, but no goals and only 3A in his final 21 regular season games. The Chicago Blackhawks have assigned goaltender Collin Delia to the AHL Rockford IceHogs, the team announced today. The roster cut leaves the Blackhawks with 35 remaining players at camp, including 20 forwards, 12 defensemen, and 3 goaltenders. The Blackhawks signed Delia to a two-year entry level deal this summer worth $767K a year. Delia most recently played for Merrimack College in the NCAA, posting a 2.15 GAA and .927 SV% in 21 games. Delia was never expected to make the big team—Corey Crawford’s backup spot is between Anton Forsberg and Jean-Francois Berube—but will round out the AHL roster for now. Sportsnet’s Elliotte Friedman reported today in his 31 Thoughts column that the impetus for the faceoff rules crackdown came from the competition committee. David Backes—a committee member—admitted to Boston media that faceoffs have devolved into scrums where the goal is to not lose rather than to win. Players were increasingly crowding the dot and focusing more on holding off the other center until a winger arrives. The tweaked enforcement standards hope to swing the pendulum back to skill-based faceoff wins. One of Canada’s most prolific international goaltenders retired this week. Charline Labonte, a three-time Olympic gold medal winner, retired from hockey on Monday. Labonte is probably the most well-known female goaltender outside of Manon Rheaume, and like Rheume, Labonte made her mark early on by playing in the men’s QMJHL. She played two seasons with the Acadie-Bathurst Titan of the QMJHL in 1999-00 and 2000-01 before eventually playing for Canada and McGill University. Labonte spent the last two seasons playing for the Montreal Canadiennes in the CWHL, and posted an astounding 1.53 GAA and .934 SV%. There is no doubt that the 34 year-old is leaving the game on a high note. The Minnesota Wild have signed captain Mikko Koivu to a two-year extension worth $11MM in total, reports the Athletic’s Michael Russo. The deal breaks down to $6MM in 2018-19 and $5MM in 2019-20. Koivu was sent to become an unrestricted free agent at this season’s end. Last season Koivu put up 18G and 40A in 80 games, good for third overall in team scoring. He has been the model of consistency for the team over his career. Koivu is not a flashy player, but he gets the job done game after game. It is not that far off to say that Koivu is the face of the franchise. The Finnish forward—Wild captain since 2009—leads the Wild in all-time games played, assists, points, shots on goal, power-play points, and short-handed goals. He is also second in goals scored and third in penalty minutes earned. BSN Denver’s Adrian Dater reported that Matt Duchene spoke to media today, but said little to illuminate the uncomfortable situation surrounding his trade rumors. Duchene is taking things “one day at a time” and “not looking that far into the future.” The Colorado Avalanche center has been mired in trade rumors for much of the past year, and was expected to be traded at the deadline last season. Nevertheless, he is still with the Avalanche for now, and is focusing on training camp. The Avalanche are reportedly asking a high ransom for Duchene, and want to ensure a better return then what they received for Ryan O’Reilly. Tonight marks the preseason debut of many NHL teams. Eight games are being played across the continent as young prospects and veteran players on PTOs try to impress coaches and management. Many teams are still carrying upwards of 50 players, so expect a deluge of cuts between now and opening night. One game that is not being played, however, is between the Los Angeles Kings and the Arizona Coyotes. That game was cancelled for bad ice and will not be made up. According to the Toronto Sun’s Terry Koshan, the Toronto Maple Leafs have given out three As tonight. Wearing the alternate captain designations are Auston Matthews, Morgan Rielly, and Matt Martin. The Maple Leafs have already announced publicly that they will not have a captain this year, and many insiders think that the team is grooming Matthews to become the new team captain. It should also be noted that preseason ’A’s are not permanent. The Athletic’s James Mirtle reports that the Toronto Maple Leafs cut 24 players from training camp today. No player cut had a realistic chance to make the team out of training camp. These cuts were made with less than 24 hours before the Maple Leafs first preseason game Monday night against the Ottawa Senators. Some players will return to the AHL Toronto Marlies while others will return to their junior teams in the CHL.